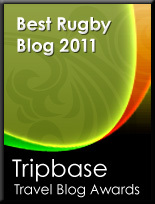 TOTAL FLANKER...a rugby blog: Salut! I somehow missed the fact that yesterday was the 4th anniversary of me starting this blogging malarkey. I raise a small glass of virtual sherry to you all (yes, both of you). Congrats! keep up the blogging, your last "how to play for Wales" post was brilliant. Congrats from your American Fan club. Keep up the great work! We all certainly appreciate your efforts. No, we don't. Yes, we do. Well, maybe sometimes. Alright then, thanks from all of us.